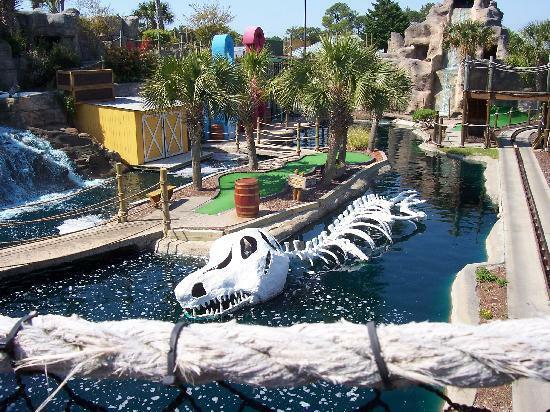 Myrtle Beach is not only known for being home to more than 100 golf courses, but also for being home to more than 60 mini-golf courses. Visitors and locals can’t miss the mountainous rolling green turf, fire-spitting volcano’s, splashing waterfalls, ship wrecked pirate ships, pyramids, windmills, animated characters, caves and more situated along the Grand Strand. Playing “putt-putt,” as Myrtle Beach locals call it, is just as fun to play as an adult than as a kid. Choose your club and colored golf ball and we’ll see you on the mini-golf course. To view the USA Today’s compiled list along with specific holes and images, click here.